The Oregon Explorer Wildfire Risk site is intended to increase wildfire awareness, give a comprehensive view of wildfire risk and local fire history, and educate users about wildfire prevention and mitigation resources. This site provides data and information for homeowners, communities, wildfire planners, managers and others to identify and prioritize local fire prevention and mitigation efforts. Wildfire risk is a major concern to many Oregon Homeowners and Communities. If you are a homeowner or community member looking for resources to help understand and reduce wildfire risk surrounding your home, keep reading. If you are a wildfire or community planner and need more detailed information to develop wildfire plans, see the bottom of this page. To access Maps and Reports depicting the wildfire risk to your home and community, click here to launch the Oregon Wildfire Risk Explorer Map Viewer. 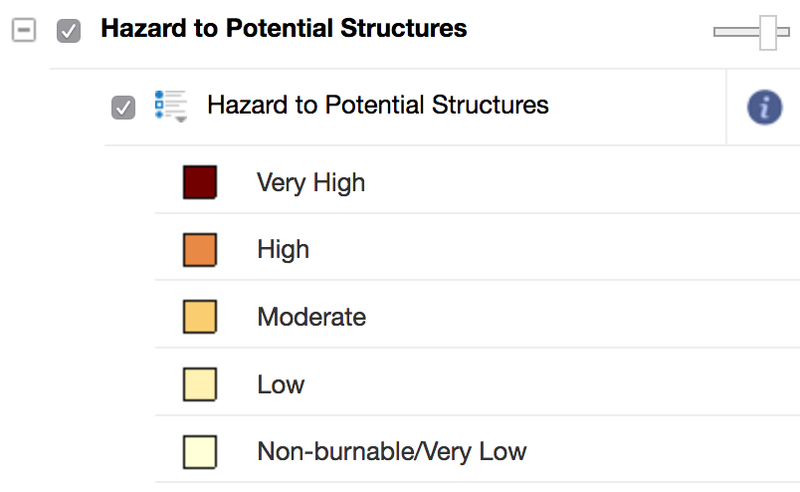 When you enter the Oregon Wildfire Risk Explorer map viewer, you will see the Home panel, which guides users to the map, reports, and list of data layers. The interactive map tool allows users to move around on the map, zoom in and out, or enter an address to find a location. To explore data layers, click on the blue Go To Layers button from the Home panel, or select the Layers tab in the lower left of the screen. Data layers include maps related to vegetation condition and wildfire risk, historical wildfire locations, and other information. In addition, various reference layers and basemaps are available to help you navigate around the state and find other information like land ownership and Firewise community boundaries. Navigate through the data layers by checking the boxes next to the data layers you want to display. Some data layers are contained in folders, which can be expanded or contracted by clicking the + or - button to the left. Activate and view individual data layers by checking the box next to the layer, and note that both the layer and the folder will need to be checked to view the layer (see example to the right where both the folder and the layer are checked). Once a layer is checked, the legend will be visible. For more information about each data layer, click the information icon to the right of the layer name. Transparency sliders to the right of the folders allow the user to view layers with partial transparency. Create a customized 8.5”x11” or 11”x17” map of the data layers you are interested in using the “make a PDF map” feature in the red I want to... button. Your map will include all the layers you have checked with the corresponding legend and zoom level. You can give your map a custom title and add any notes. The Oregon Wildfire Risk Explorer Map Viewer allows you to generate two different types of reports: a Homeowner’s Report and a Summary Report. The Homeowner’s Report provides information about the wildfire risk in the area around a home, aerial imagery of the location, tips for creating and maintaining defensible space to reduce wildfire hazard, and contacts and resources for more information. Note that these maps provide information about the broader landscape context of wildfire risk around a home, and may not be accurate at the scale of an individual property. The Summary Report provides maps, charts and interpretive information about wildfire risk across a broader area. The user can specify whether they want to produce a map for their County or 5th-field Watershed (HUC10). Clicking on a location on the map and selecting the report type in the summary panel on the left. 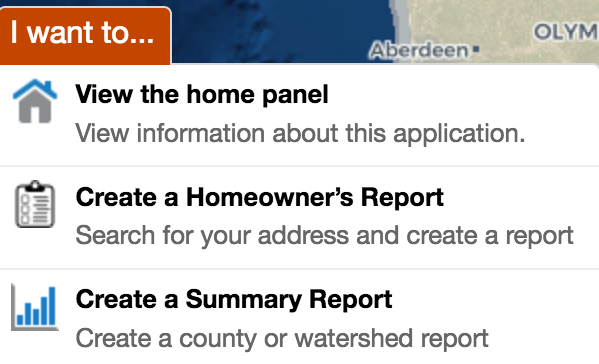 Clicking on the red I want to… button at the top of the map and selecting Homeowner’s Report or Area of Interest Report. This menu also contains other useful functions for navigating and exploring data. Clicking on one of the the report icons in the Home panel, on the lower left. at the top of the page. In the “Explore Related” sections below, specific resources (tools, videos, organizations, etc.) of interest are highlighted. 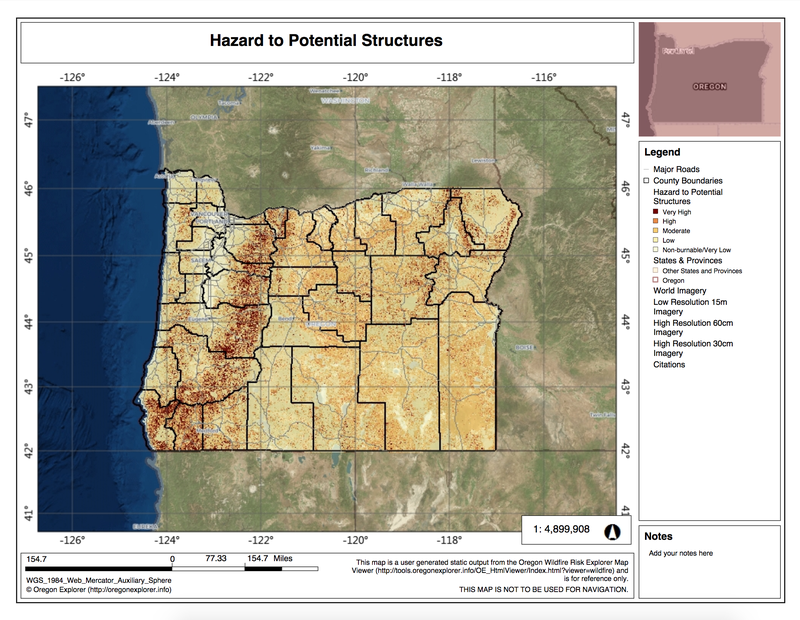 If you are a wildfire professional or planner, see the Advanced Oregon Wildfire Risk Explorer Map Viewer and reporting tools to access more in-depth information about wildfire risk for planning and produce a customized Wildfire Risk Planning Report.